Unfortunately, I could not find a way to attach it to blogger, so sorry for the extra step. Check out my post on subsetting if this syntax is confusing. 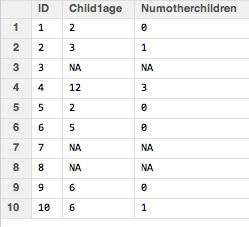 In a nutshell, R evaluates all rows and keeps only those that meet the criteria, which is only rows where Age has a value of under 40 and all columns. More on ifelse() statements here. 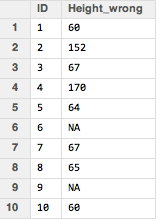 The ifelse() function is really useful, but is actually overkill when you're just creating a binary variable. This can be done faster by taking advantage of the fact that logical values of TRUE always have a numeric value of 1, while logical values of FALSE always have a numeric value of 0. 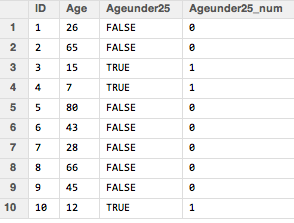 We can see that the Ageunder25_num variable is an indicator of whether the Age variable is under 25. 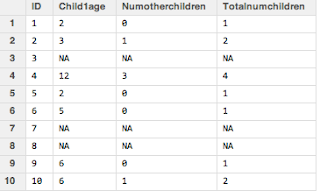 I have in my dataset the age of the last child born (and probably other characteristics of this child not shown), and then just the number of other children for each woman. I want to get a total number of children variable. I can do it simply in the following way. Nice tricks. Its hard to get a Health Data Management Services. 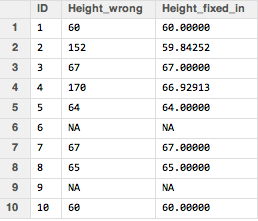 Data types, part 3: Factors!